A clear and richly-flavored soup made from beef brisket or shank and bone marrow—a hearty dish that should be eaten hot with fluffy fragrant rice. You should choose the appropriate meat (we are using shanks) and make it as tender as possible. Simmering beef or any other meat for longer periods of time makes it tender and releases all of its flavor. This is probably the reason why traditionally cooked Filipino Recipes tastes better — time and patience is always part of the ingredient. 1 Cover the beef brisket or shank in water in a pot and bring to a boil for 10 minutes. Remove the beef, discard the water and clean the pot. 2 Return the shank to the pot, cover with 8 cups (2 liters) of water and bring to a boil over high heat. Boil, uncovered, until the broth has reduced by half, nabout 1 hour. 3 Add the onions, leeks and banana heart or cabbage, and cook for 30 minutes over medium heat. Season with the fish sauce and pepper, then add the tofu and stir to mix well. Serve hot. 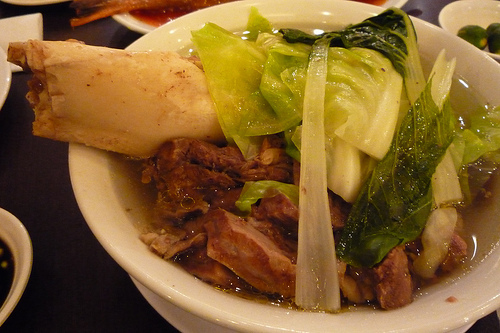 Note: The beef shank is boiled twice to reduce the fat content in the soup. To prepare the banana heart, remove the tough outer layers until you reach the tender inner heart of the banana flower. Cut these tender parts lengthwise into matchsticks and soak in lightly salted water to prevent discoloration until ready to use.